@gmail.com; please include links to the one(s) you like and keep your request to just a few. Did you enjoy your experience at the Skills Clinic? We bet you did, and that you learned a lot, too! Consider helping us out by joining and/or making a charitable contribution, and thanks for your support! Continually offered since 1992, CORBA's free skills clinic program has provided thousands of mountain bikers with instruction and skills to become better and safer riders! Mountain Biking Skills Clinics are taught every month as part of CORBA�s ongoing effort to educate mountain bicyclists as to the appropriate use of the Santa Monica Mountains National Recreation Area backcountry trails. Mountain biking is a lot like tennis or skiing. Just a few minor adjustments in technique can make a huge difference in your control and proficiency. If you want to get better faster, you need to know the fundamentals of mountain biking technique. Whether you're just getting into mountain biking or have been riding for years, you'll learn some valuable tips from our Introduction to Mountain Biking Skills Clinic that is offered each month. 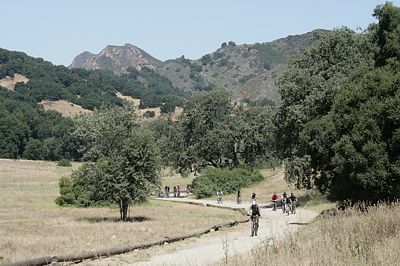 The Introduction to Mountain Biking Skills Clinic is held the first Saturday of each month from 9:00 am to 1:00 pm in Malibu Creek State Park. It is free of charge to all participants, and no reservations are needed. A discussion of backcountry preparedness, shared use etiquette, and simple maintenance tips precedes several skills stations. These include proper seated rider position, controlled braking and slow speed technical maneuvering, pedaling cadence/gear use, and proper riding position and technique for climbing and descending. Please arrive no later than 8:45 am to sign in and have your bike checked. There is approximately five miles total of actual riding on easy to moderate trails. We have a complete Equipment and Bike Safety Checklist you should review before the class. Children 10 years or older are welcome (must be accompanied by a parent or legal guardian) preferably with a multi-geared ATB-style bike in good working condition. Helmets are mandatory for all participants. The clinic will not take place if it is raining heavily during clinic hours. Red flag conditions will not cancel the clinic. From the San Fernando or Conejo Valleys, take the Ventura Freeway (101) to Calabasas, exit Las Virgenes Road/Malibu Canyon. Go south 3.5 miles. 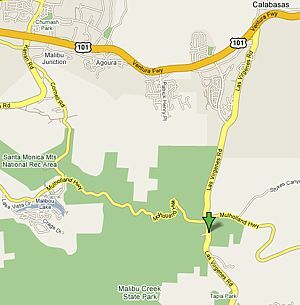 You will cross Mulholland Highway and go another 1/4 mile to the entrance to Malibu Creek State Park on the right. From Santa Monica, take Pacific Coast Highway north to Malibu Canyon Road and turn Right. Go 6 miles to the park entrance on your left. In the park, just past the ranger kiosk at the entrance, to the left is a large gravel parking lot that runs parallel to the road. This is where the group meets. Do not go to the lower paved parking lot. If you are interested in private instruction from Mark Langton, the Intro Skills Clinic coordinator and lead instructor, contact him at (805) 558-1606, mtbskills@corbamtb.com, or at www.mountainbikeskills.com to schedule an appointment. CORBA members receive a discount!